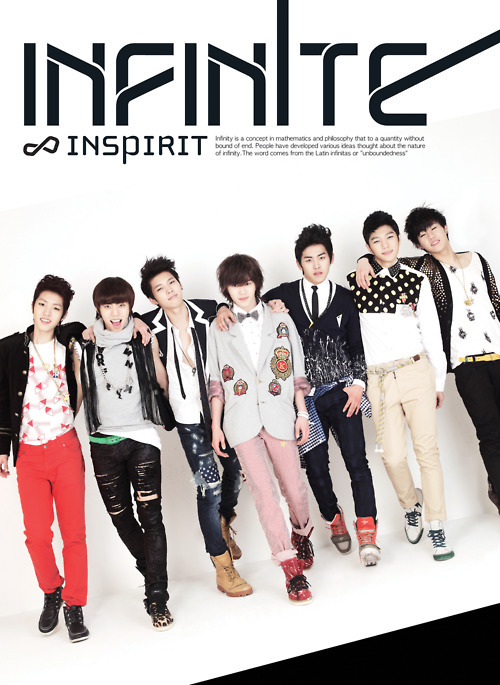 Rookie group (I’m gonna have to stop using that soon) INFINITE makes a comeback from Before The Dawn with their third album, the single Inspirit. The album was released a day earlier than scheduled on March 16, due to the music being leaked online (Boo). The album consists of three tracks: “Nothing’s Over,” “Shot,” and a remake of “Can You Smile.” They’ve been teasing their comeback with snippets of the title track “Nothing’s Over” which is a return to sweetness after the bad@$$-ness that was Before The Dawn. The whiplash of the 180º change in concept might be a little much for some fans… I know I have a little pain in my neck right now. Check out the MV, which was also released a day earlier than planned, that stars Sung-yeol as a forlorn, maybe lovesick soul who gets advice from his buds. Okay, it’s not too sweet, like Orange Caramel sweet, and after listening to it a couple of times– it’s growing on me. At first listen I didn’t care for the song that much, but after watching the MV… yeah I’m a sucker for a good MV. I liked that their MV was something different, with funky sets and cool transitions (I hope they didn’t waste all that toilet paper, send it to Japan!). The only thing that I didn’t like about the MV… their clothes. WTH, not even SHINee wears those jeans anymore! Stylists, you gotta love to hate them. INFINITE will continue their comeback with appearances on the weekly music shows beginning with Mnet’s M!Countdown.